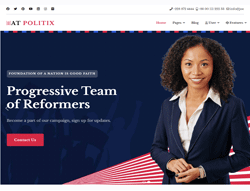 AT Politix is responsive Joomla template tailored for Politics Joomla template websites. Politics may seem like something it’s done behind closed doors these days but, in reality, you need people to believe in your ideals and vision. To gather as many people as possible you need a good online presence, supported by a great and modern theme. The crazy popularity of Internet and social networks forced politicians to change their traditional approach and create new and exciting ways to attract supporters. In a world filled with all sorts of sites and campaigns you really need a fantastic theme to catch people’s attention! The visual effects are simple using high quality images and big sliders. The Politics Joomla Template Website have integrated the grid like content display in order to create a structure that is easy follow. Contrasting colors are used to attract the eye on the most important areas of the page. This way, the viewer gets to read about your cause and your message from the first seconds it lands on your page. Beside, build your business more growth and prosperity. Make your sites displaying on both mobile and tablet with 100% responsive layout. Moreover, it builds on powerful framework with completely Bootstrap CSS Framework, Support Font Awesome and K2 extended style, 4 color styles and boxed layout helping to create flawless websites with various layouts. Run the best online campaign with Politics Joomla Template and convince people to join you! Purchase the right theme today!